Each Monday, the students receive a piece of colored paper, this is their warm-up sheet for the week. Everyday when they come into class there is a warm up on the board of what they learned the previous day and they do their best to solve the problem. Sometimes it is a word problem, other times it is a match up of equations and solutions, but no matter what it is they always work through the problem individually and then we work through it as a class. The last section of their warm up sheet is a "Questions, Comments, or Concerns" section. At the end of each week they turn in their warm up sheets and I get to read through how they have solved each problem. This not only gives me the chance to see how their understanding is coming along, but also to be made aware of anything happening in their lives through that Comments section. For the most part, I get a drawing or a riddle, sometimes they don't write anything, and other times they write about how their life is going. No matter what they write me it is a nice check-in at the end of each week. During each quarter the ELA students participate in, and lead a Socratic Seminar on whatever novel they are reading that quarter. This particular Socratic Seminar was about "The Big Burn", a story by Jeanette Ingold about the Northwest fires in 1910. 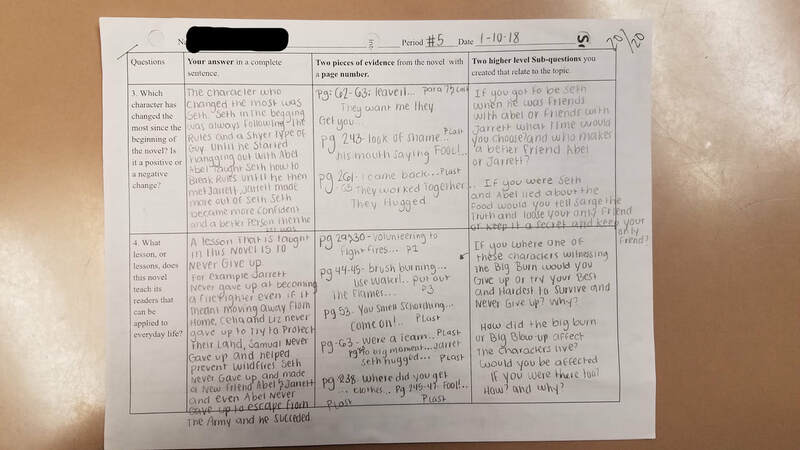 I provide the students with higher level questions that will get them to think more deeply about the novel, as well as their interactions with the story and its characters. These higher level questions are answered by the students before the Socratic Seminar, using textual evidence and their own real life experience. They then take these questions, and their responses, into the seminar and spend 45 minutes discussing their thoughts and delving deeper into the novel and its meanings than they did individually. I encourage my students to self-evaluate their work on a regular basis because I find it important to have them assess themselves, there are multiple reasons for this. The first reason is because it gives them the opportunity to double check their work on a more thorough level before I grade it, the other student centered reason I do this is because I want them to review their work and know that they have put their best effort into what they are handing in. The last reason I have them self-assess is because it helps me get a feel for where they are in their learning, and in their understanding of the knowledge they are supposed to be getting through their work. Below is a picture of a rubric that I used to grade my students essays during second quarter. I gave these rubrics to the students when they originally started writing their essays to give them a template to work with. Before they turned in their work I had them self-grade their essays and then I graded them based off of what I saw.